This post is for Reem! The last time I saw her she pleaded for someone to show her how to make ice kacang. Now before this I had never even considered putting a 'recipe' up for ice kacang, since there isn't really any kind of recipe, you just throw it together. Consisting of shaved ice, sweet syrups, jellies and fruit, it's a mish mash of whatever you can get your hands on or whatever you prefer. 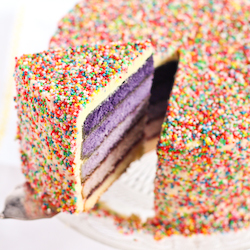 It is the PERFECT icy dessert on a stinking hot day (like the ones we have been getting in Sydney recently). 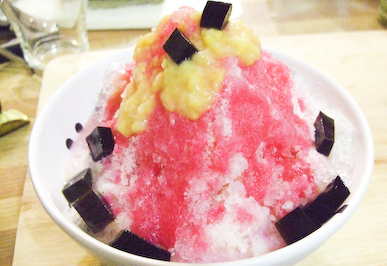 It is essentially a more complicated and very strange snow cone. But oh so good. 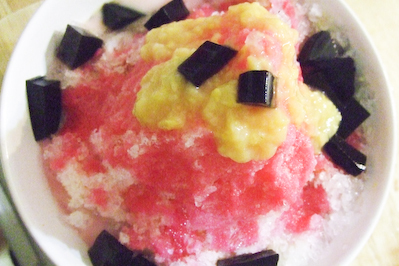 I'm not going to tell you exactly how you should make ice kacang. The way I make it is probably completely different/wrong to what you may already know. 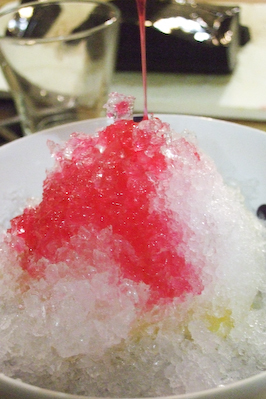 But for me there are certain ingredients you have to have to make a really good Malaysian ice kacang. 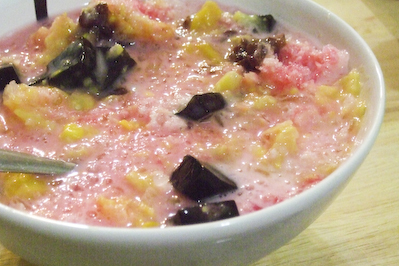 You may remember I made ice kacang macarons, inspired by this Malaysian dessert. The macarons are great in winter when it's way too cold for it, but the other night it was 32°C at midnight and we were desperate for something super cold. 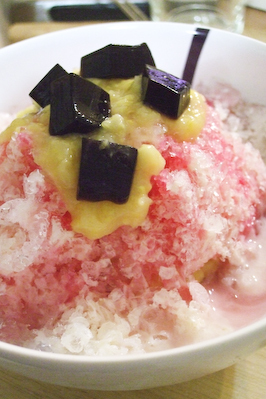 And if it's a hot day, an ice kacang is the ultimate dessert to cool you down. The Malaysians have muggy hot weather all the time, so they know what they're talking about. LOTS OF IT. Don't knock it until you've tried it. I will preach over and over that corn is great in desserts and when you combine the creamed corn with the other things it is perfection. I usually use between 1/2 to 1 cup of creamed corn in a bowl of ice kacang. It may look like a lot when you put it in but it disappear quickly amongst all that ice and syrup. You could also use whole corn kernels, but I like the texture of the creamed corn. 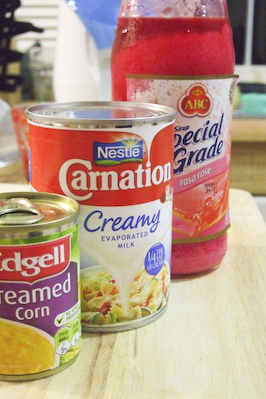 Some people might like to use condensed milk, but normally the stalls sell it with evaporated milk since they use so much rose syrup and/or palm sugar, condensed milk usually makes it way too sweet. I like to punch a hole in the top of the can to make it easy to pour. I usually use about 2-3 tablespoons of it. This is a MUST for me. If you don't like rose syrup, go eat cendol. Remember, this is not rose water, it's a bright pink, very viscous rose flavoured cordial, available in most Asian supermarkets. If you can't get your hands on this, don't fret too much. It's a pity, but you can still use any cordial or sweet syrup you can get your hands on; raspberry cordial works (you could add a tiny bit of rose water to make it similar to rose syrup), palm sugar (gula melaka) is commonly used as well, pandan essence. The thicker the better, so that it gets sucked up by the ice and doesn't make it a big puddle straight away. The brighter the better, you gotta love the crazy pink colour of rose syrup. I use a lot of rose syrup, and usually just do it to taste. I think I use around half a cup. So in my humble opinion, once you have these three things, you can already be happy, go forth and make an ice kacang. I've made it with just these three things before and I haven't had any They are the main flavours of the dessert, so anything else you can get your hands on is just bonus. I do love to add lots of other things, because its very fun to dig into that mountain of ice and find all these sweet hidden surprises underneath. 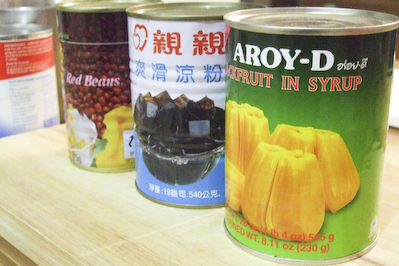 Some possible extras include sweet red beans (azuki beans), grass jelly (a herbal, green/black coloured jelly), canned jackfruit, palm seeds, basil seeds, green pandan jelly noodles (like the ones in cendol) and canned lychees. All of these are usually available at any Asian supermarket (I raided Miracle supermarket at Macquarie Centre for my stash). But there's no reason why you have to use these, any sweet jellies (like the ones in bubble teas) work, and any canned or fresh fruit will work too! 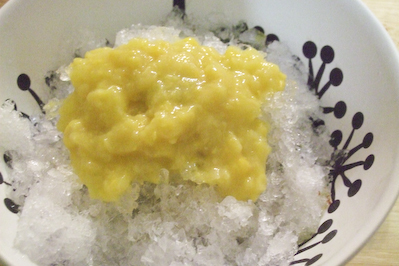 Cut up any fruit or jelly that you are going to use for your ice kacang. 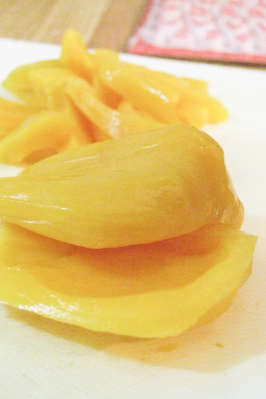 I usually use about one chopped up jackfruit per ice kacang since it's quite strong flavoured. 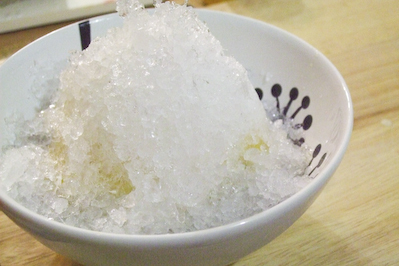 Place fruit and jelly in a small chilled bowl that you will use to serve your ice kacang. 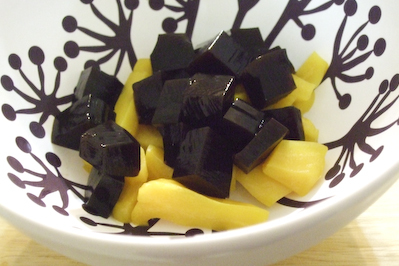 I use about a half cup of grass jelly per bowl. 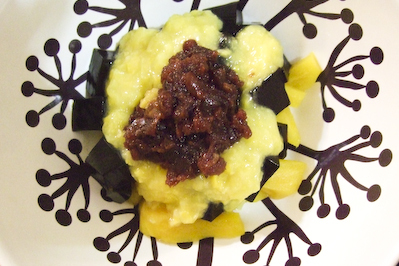 Also add your ton of creamed corn a bit of the red bean paste to the bowl. About 2 tbsp of red bean paste, or however much you want. I find if I add too much the whole thing becomes a little too powdery. Make sure you have a load of ice ready. By whatever means necessary, crush up your ice. 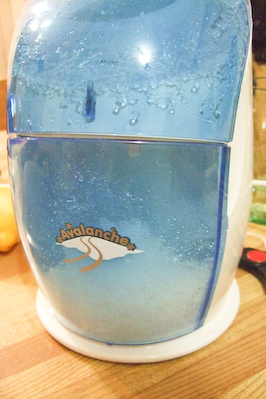 I was lucky enough to get this handy snow cone maker for my birthday from A. It's usually better if you can blend your ice straight into the bowl, to avoid melting it more by touching it. I didn't really have a choice though. I like to hide a layer of corn within the ice. You can never have too much corn! Heap up the ice as high as you can in your bowl (I ran out of ice so this is as high as I could get). You have to work fast from here to get to served before it melts into a big sticky puddle. Pour the rose syrup over your mountain of ice. Ooh and ahh at the pretty colour! Add any other syrups and cordials that you want here too. Pour the evaporated milk on over the top. And maybe more rose syrup if you don't think it looks pink enough. 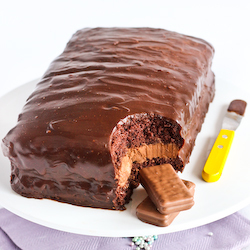 It still tastes good even after it goes all melty! Enjoy! 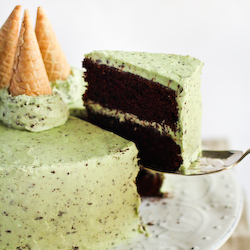 YUM, YUM, YUM! Can't wait to try this! Oooooooo... Love it! I also like to drizzle it with palm sugar and Sarsi!!!!!! 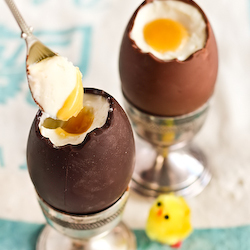 I tell you - we desperately needed this recipe last Saturday and Sunday! It was hot hot hot and this looks perfect for 40 degree weather! I heard there is more of this heat to come so this will definitely be bookmarked! LOL! "If you don't like rose syrup, go eat cendol" - that's brilliant! Hehe. 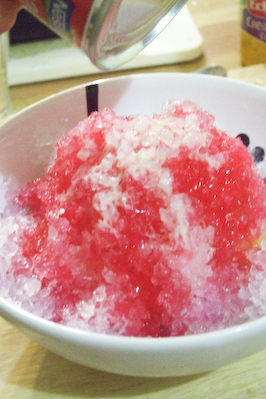 Ice Kacang's are so perfect on a super hot day, I love finding all the little treats underneath! And I agree, you can never have too much corn!! Reemski - Hehe I can't wait for you to try it! Ellie - Oooooh sarsi! I'm going to have to try that now! Lorraine - Trust me, I made sure I had some on that day! Haha can't wait to see what you came up with! Conor - Hahaha good to know its not creepy :) Thanks! Yas - Haha yeah I'm usually too lazy too, but once i buy it i keep it in jars and it lasts for ages! Betty - :D It's true! Rose syrup is important! Ice Makers - Haha thanks very much!